Abstract: The application of topology in mathematics is creating a range of new opportunities throughout photonics. This emerging field of topological photonics was inspired by the discovery of topological insulators, in which interfacial electrons transport without dissipation, even in the presence of impurities. Similarly, the use of carefully designed wavevector-space topologies allows the creation of interfaces that support new states of light with useful and interesting properties. In particular, this suggests unidirectional waveguides that allow light to flow around arbitrary imperfections without back-reflection. In this talk, I will show how this new degree of freedom in band topologies can be used to create one-way waveguides at the edges of two-dimensional topological photonic crystals and chiral surface states on the surfaces of three-dimensional topological photonic crystals. These novel states of light can potentially enable photonic circuits less dependent on isolators, slow light insensitive to disorders and robust photonic designs in general. 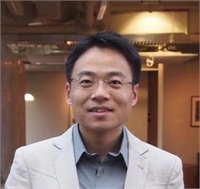 Biography: Ling Lu is currently a postdoc in the Physics department of Massachusetts Institute of Technology working with Prof. Marin Soljačić and John Joannopoulos. He obtained his bachelor in Physics in 2003 from Fudan University in Shanghai, China. He did his Masters in Physics and Electrical Engineering and Ph.D. in Electrical Engineering in 2010 at University of Southern California in Los Angeles. His thesis work is on photonic crystal nanocavity lasers for integration, advised by Prof. John O’Brien. His current research focuses on topological photonics.